Are you ready for a challenge? Well, there are some challenges we can never be 100% ready for because some elements are just out of your control: just like the Dragon Challenge. The challenge took place on Tianmen Mountain in Hunan province, China. The Dragon Challenge consists of driving from the bottom of the mountain around 99 sharp turns and up 999 steps, to reach the final destination: Heaven’s Gate. This challenge was taken on by Ho-Pin Tung, a professional racing driver in a 2018 Range Rover Sport. The three main factors that determine the success of this challenge are the vehicle, the driver and the weather. Read on to discover if they were all up to the task. There are many mysterious stories about the Tianmen Mountain, some people have even claimed the road is alive. 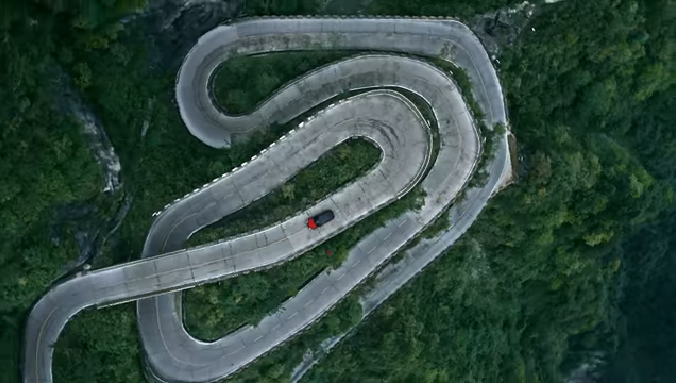 When seen from above, the 99 hairpin turns look like a white dragon on the move. But one thing is certain, the road is deadly and you can’t afford to make even the tiniest mistake. 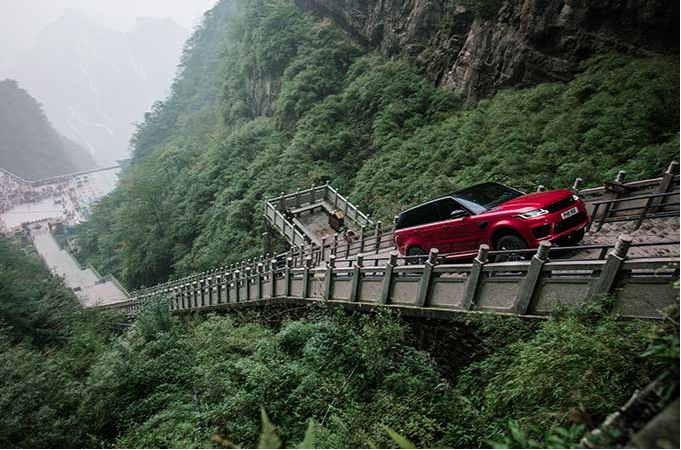 Thanks to his driving expertise and the capability of the 2018 Range Rover Sport, Ho-Pin Tung was able to complete the 7 miles of mountain road with great success. And after the 99 turns come the most challenging part, driving up the 999 steps to reach Heaven’s Gate! Since the construction of Heaven’s Gate, nobody had ever tried to drive up to it. This was the first time in history that anyone dared to take up this challenge. And when interviewed, people that work and live around the mountain said of the task, “it is impossible.” This is an understandable statement since the drive up towards Heaven’s Gate is steep, very steep in fact, the slope sits at a 45-degree angle. This means that if at any point the vehicle loses traction, gravity will take over, causing the vehicle to roll down the mountain. Success was not guaranteed because of the unpredictable weather, but Land Rover still decided to take on the challenge even though the outcome was not 100% certain. If at any time it started to rain or fog, the steps would’ve become too slippery and the vehicle might’ve rolled down with fatal consequences for the driver. But after what took a lot of determination, courage, and power, Ho-Pin Tung made it successfully to the top, welcomed by the beauty and brightness of Heaven’s Gate. The entire Dragon Challenge was completed in 21 minutes and 47 seconds. This marked another great achievement for Land Rover and Ho-Pin Tung’s career as a professional racing driver. Once more, Land Rover proved that their vehicles are capable of taking on any challenge, even the impossible ones!